Is that a red cloth in the background, left hand? I hadn't noticed how vivid it is before. Its not obvious to me, but my eyes are not good. Sorry, I should have specified that the painting in the link is not as cropped and that's the one I referred to. Anyways, this is a painting I absolutely adore. Thanks again for such frequent updates to your blog. I don't know how you do it. You're right, that's interesting. And I didn't realise mine was cropped. Not sure what that red is meant to be though. I'm retired and not been well so the blogs keep me busy! The red cloth is the banner that the knight was holding high and that now rests on the ground, symbolizing the strenghts of the man, now totally capitulated and prey of the dangerous 'Dame sans Merci' (see the staff that the man is holding, that is the banner). The image portrays a man about to fall, yet not fallen. It's a truly magical moment, the victim is ensnared, there is no escape. 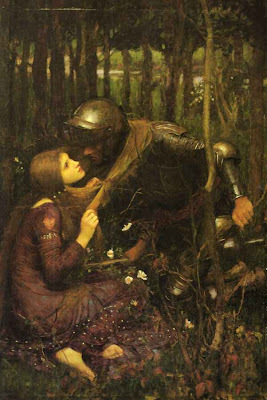 Waterhouse's leading ladies are beautiful, dangerous seductresses or hopeless victims of a cruel fate.